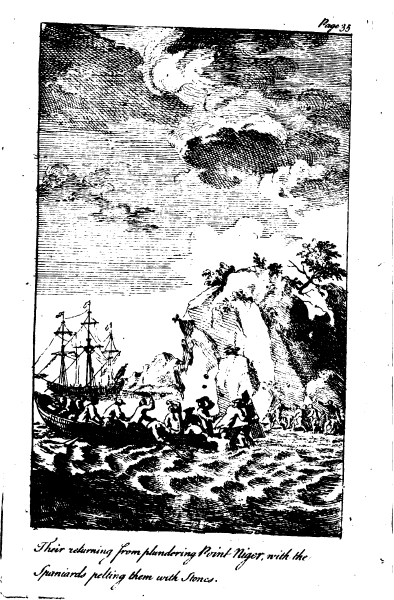 Copperplate engraving from The Life and Surprizing Adventures of James Wyatt, published 1753, Google Books. Continuing the story of the privateer trumpeter James Wyatt, we follow the crews of the Revenge and (I believe that's the vessel in the background here) Hamburgh. 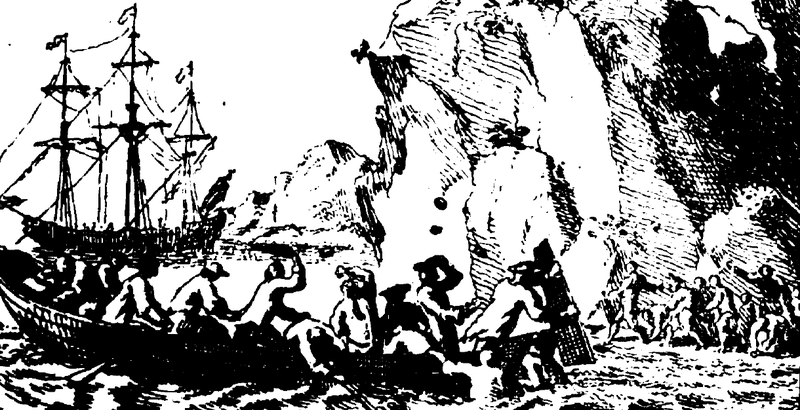 By chance, the Revenge chased and caught up with what prove to be a fellow English privateer. Her captain told the Revenge he had successfully raided a wine cellar at Point Niger, and the only thing preventing him from taking more was that his boat was too heavily laden with plunder. At that, Point Niger was virtually defenseless and prime for another raid. Hamburgh and Revenge sailed to the point and Wyatt was chosen as one of eleven sailors to accompany the master and second lieutenant ashore. Hamburgh's captain warned them against the raid, saying that the coast appeared to be more populated and well defended than their fellow privateer thought. On landing, they were opposed by the Spanish residents of the point, who threw stones at them, but made no organized effort to resist. Wyatt and his mates were disappointed to find the wine cellar empty, except for some women's shifts which, for some reason, they put on over their slop clothes. Taking their time to seize other, less valuable plunder, the privateers were surprised to see "near an Hundred" residents gathered on the hills armed with rocks and some firearms. The two sides exchanged gunfire, and the sailors ran back to the boat. Unfortunately for them, the boat struck hard on a rock, and the sailors had to wade through four feet of water to clamber in. This soaked their powder, and the Spaniards closed it, pelting them with stones. The master ordered Wyatt to the rudder, which he unshipped and used as a shield. Despite the dangerous situation, the shore party managed a narrow escape, and gave the Spanish three cheers before rowing back to their vessel. The crew do not appear to be wearing the shifts they stole, except perhaps a larboard oarsman amidships. Instead, they wear jackets with cocked hats and at least one round hat. Wyatt can be see in the stern trying to shield himself and his mates in the water from the stones.